Heather MacRae and Katy McNicoll are among the players set to take part in two separate qualifiers for this year's M and H Logistics Scottish PGA Championship. The 18-hole shoot-outs take place at Crieff on August 28 and 29, when the hopefuls will also include former European Tour player Craig Lee. MacRae, pictured, who hails from Dunblane but is now based in Portugal, is no stranger to locking horns with her male PGA counterparts. 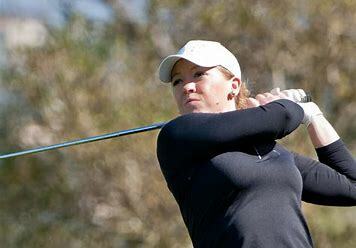 In 2009, she became the first woman to play in the Scottish PGA Championship for 76 years and has made subsequent appearances in the Tartan Tour's flagship event. MacRae, a former British Ladies' Amateur Stroke-Play champion, plays mainly at the moment on the LET Access Series, winning the Belfius Championship in France last season. For McNicoll, the qualifier will be a chance for the Gullane-based PGA trainee to pick up her own clubs after a spate of caddying duties in recent weeks. She was on brother Keir's bag when he played as a marker in the final two rounds of the 147th Open Championship in Carnoustie, where the pair are from. Katy then put her knowledge of Gullane to good use to help her long-time friend, Kelsey MacDonald, make the cut in the Aberdeen Standard Investments Ladies Scottish Open. Joining MacRae and McNicoll in the battle for spots in the M and G Logistics Scottish PGA Championship at Gleneagles from October 15-18 will be Hilton Park's Jorden Ferrie. Keir McNicoll is also set to play in one of the Crieff qualifiers, as is Lee, who hasn't played much at all this season but was in the mix at halfway in the Aberdeen Standard Investments Scottish Open qualifier at Longniddry. Others hoping to join the group of exempt players led by defending champion Chris Kelly in the 72-hole event on the King's Course include Graeme Brown and Stephen Craig. Shona Malcolm, The PGA's Regional Manager for Scotland, said: “Yet again we have two strong fields of members aiming to qualify for the M and H Logistics Scottish PGA Championship, the flagship event in Scotland and the final one in the Tartan Tour’s “Road to Gleneagles” Order of Merit. "The rewards for qualifying are significant, providing those who are successful with the opportunity to join those members already exempted into the final field to compete for a prize fund yet again in excess of £50,000.